Editor's Note: As part of an ongoing series where a member of the Holl & Lane team reflects on the theme of the latest issue, this post is in response to the Holl & Lane Volume I, 2017 Collection issue themed around "The Beginning". With every issue of Holl & Lane Magazine, we curate the stories in the magazine based on a theme. The theme for our latest volume is “The Beginning” and I was so excited to see everyone’s interpretation of that theme. Because it’s a word that can mean many things to many people. The word “beginning” itself has a few different definitions (Merriam-Webster Dictionary actually defines it in 4 ways) but the main definition is “the point at which something starts”. That’s not a very poetic definition, right? It kind of kills the magic. To me, a beginning is so much more. The day I was born was not the point at which my life started. It was the day I drew my first breath, announced myself with my first roar, and melted my parents into a puddle of sweet bewildering joy. My first skinned knee was not just a physical injury. It was a reminder that life can be painful, and solace can be found in the ones we love. My first kiss was not a physical meeting of the lips. It wasn’t even really about my lips, to be honest. It was the manifestation of my pounding heart, sweaty palms, and the butterflies in my stomach. You get the idea, right? 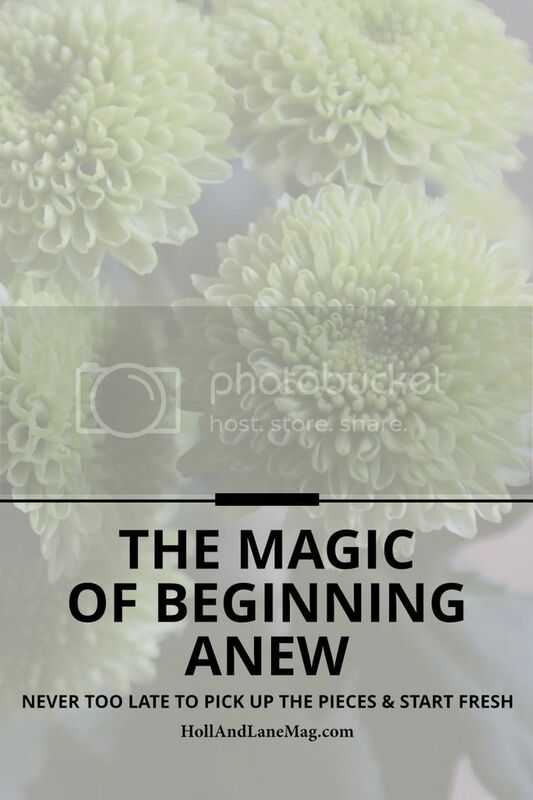 As a writer, I’ve always been drawn to the beauty of a new beginning. The promise, the potential, the hopes and dreams – they all spring from the fountain that each one of us has inside. It’s why we all gather in January and make our goals and resolutions. We can’t resist the draw of a blank slate. It’s just a part of life. We grow, we transition, we figure out what we like or don’t, what we value or discard. We become who we are meant to be in these periods of trial and error and triumph. I think it’s why when something ends, we often have a very strong response to it – relief, sadness, anger. The honeymoon phase of any beginning is hypnotic and no one likes leaving the ball and going back to Cinderella-ville. But we will all pick up the pieces and begin again every single time. So if you ever find yourself worrying about what Aunt Sally will say at Thanksgiving about your new relationship/job/wardrobe/outlook on life, or if you’re scared about going back to the drawing board – don’t be. Stop, drop, and shut the door on those inner and outer critics. Don’t let go of the magic and just "start." Choose to begin anew. And you can begin anytime. Mia is a freelance copywriter, transcriber, and self-proclaimed word nerd. She is also the Editorial Manager for Holl & Lane. She loves donuts, laughter, and cheesy action movies. Mia lives in Virginia with her husband and 2 kids.